Helping those in need has taken him on a lifelong journey of learning. At 26, he earned a law degree to provide free legal advice. At 40, he completed a three-year Mandarin training course so he could counsel non-English speaking prisoners here. 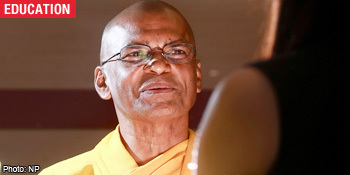 Now, Buddhist monk Nakulugamuwe Sumana Thero, 60, is back in school again. The Singapore permanent resident, who was born in Sri Lanka, is pursuing a three-year Bachelor of Counselling at SIM University (UniSIM). He has been counselling senior citizens, drug addicts and prisoners for more than 20 years. So why bother with the paper chase? Reverend Sumana said: 'Previously, I'd just use my religious knowledge during counselling to advise the person on how to change for the better. The second-year UniSIM student had no prior formal training in counselling. Rev Sumana had graduated from the University of Colombo in Sri Lanka with a LLB in 1976. He was admitted to the bar but chose not to practise law due to opposition from the religious and legal fraternities. He recalled: 'The religious associations felt as a lawyer, I'd have to twist the truth, thus violating Buddhist principles. The controversy played out in the media for three months and ended up in court when several religious associations sought to prevent him from practising. Although the court ruled that it was the monk's civic right to practise, he decided not to take the lawyer's oath in the end. Rev Sumana said: 'It was not a waste of my education. I can still advise people on the various outcomes of going through the legal process. His law degree also resulted in an unexpected benefit more than 30 years later. Based on his qualifications, he was awarded a UniSIM scholarship, which covers all the tuition fees for his degree, including exam fees and course material. Rev Sumana first came to Singapore in 1982. He was invited to be the resident monk at a temple run by the Sri Lankan community here. He also counselled drug addicts. He later helped to establish the Society of Buddhist Volunteers, a welfare organisation that caters to senior citizens. Rev Sumana said he later extended his counselling services to prisoners. When he realised that '99 percent of prison counselling is conducted in Mandarin', he left for the National Taiwan Normal University where he studied Mandarin from 1987 to 1990. Scholarships from the Taiwan university and the Society covered his tuition fees. He said the Society had offered him a salary for counselling senior citizens when they applied for his permanent residency. Rev Sumana said he has been able to apply what he learnt from the course, like interview techniques and how to conduct group counselling, to his work. However, he has had to reduce his prison counselling sessions from three to five days a week to two to three days. 'Besides attending classes for two to three hours twice a week, we also have to do online tutorials and research, and there's lots of reading,' he explained. Rev Sumana said his biggest challenge so far is the technological hurdle. He recalled how he submitted his first assignment wrongly and found out only when the IT department informed him. The university then arranged a special session with the IT staff for him.